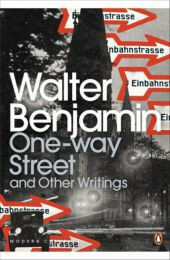 Produktinformationen "One-Way Street and Other Writings"
Walter Benjamin - philosopher, essayist, literary and cultural theorist - was one of the most original writers and thinkers of the twentieth century. This title brings together Benjamin's major works, including "Unpacking My Library"; "One-Way Street"; "The Work of Art in the Age of Mechanical Reproduction"; and, "Brief History of Photography".Walter Benjamin - philosopher, essayist, literary and cultural theorist - was one of the most original writers and thinkers of the twentieth century. This new selection brings together Benjamin's major works, including 'One-Way Street', his dreamlike, aphoristic observations of urban life in Weimar Germany; 'Unpacking My Library', a delightful meditation on book-collecting; the confessional 'Hashish in Marseille'; and 'The Work of Art in the Age of Mechanical Reproduction', his seminal essay on how technology changes the way we appreciate art.